With the Summer season coming to an end, I find myself wishing for cold weather, layers and all the Autumn/Winter nail polish shades I can get my hands on. My obsession with metallic shades hasn't changed and Nails Inc Kabaret is the perfect place to start. 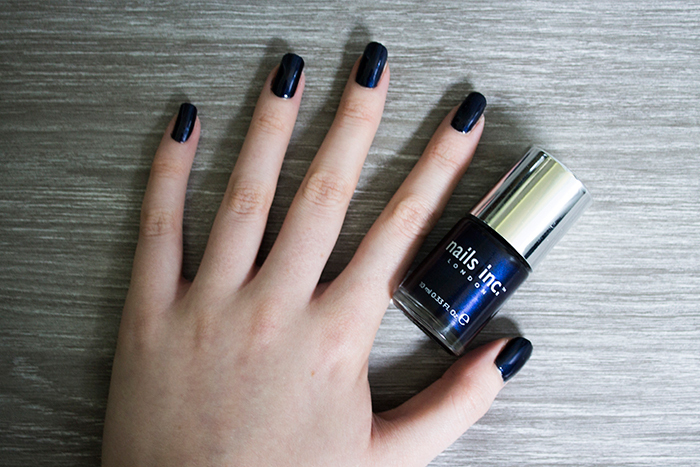 Nails Inc's Kabaret is a beautiful navy blue metallic shade. Now I love your average navy blue but the metallic factor really adds an extra dimension to it. The shade itself applies really well, a smooth application and it's dry before you know it. Usually I find these types of polishes apply beautifully but tend to chip easily. I'm usually not one for top coats but I made an exception this time and teamed this shade up with the trusty Seche Vite top coat which made it last much longer. It's one of those shades that looks great on everyone but it's definitely far from boring in my opinion. If you pick this up, you won't be disappointed.